Why is Merino Wool a Great Choice for Diaper Covers? Let's ask the sheep ~ it keeps them dry and happy too! Wool is an amazing fiber. Wool has been keeping us warm or cool through all climates, all the while keeping us in style for years! The natural combination of breathability, absorbency, softness, and water-repellence are why, there is NO question merino wool is the best choice for cloth diaper covers. Merino wool is a protein based fiber made from Keratin – natural and renewable. Fine merino wool fibers bend when touched – therefore you feel softness instead of a rough, scratchy feel. Merino is soft and luxurious ~ resembles the hand of cashmere. 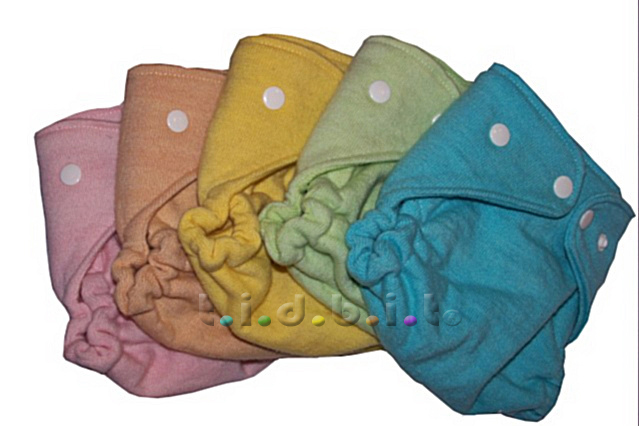 Easy Care – Wool diaper covers only need to be washed once every 1-2 weeks or when soiled. Hang to dry between diaper changes! Breathable – Wool both absorbs while resisting moisture. Keeps skin temperature regulated. Allows moisture to evaporate. 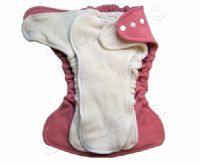 Less, if any, diaper rash and wool is better for babies bottoms than plastic conventional covers or disposable diapers. Odor resistant – Wool has natural antibacterial properties. Odors are caused by bacteria growing – no bacteria, no odor! Wool covers can be air-dried between diaper changes. Self-Maintaining – High lanolin content in wool neutralizes the urea in urine (turns to a salt). Therefore, no odor until the lanolin becomes less. Durable – Wool fibers can be stretched and return to original shape. Incredible comfort for babies growth and movement. Naturally flame retardant – No need for chemical flame retardants. Sustainable – Sheep are shorn annually. If you have not tried a Merino wool diaper cover ~ please do! I am really liking this wool in two set. I have now lanolized the wool cover three times. I've noticed a cumulative effect and now I think I've gotten it to it's full moisture resistancy. I was a little intimidated by the lanolizing process at first, but it's cake. Really easy. I find myself using wool most at night and might get up midway and change the soaker, but the wool lasts the night through. Then in the morning I hang the wool to dry and it's ready to use again that night. Love it and am going to invest in more wool. So yeah, I highly recommend this system. It's versatile - it comes with a snap in soaker & doubler, but you can use with a fitted or prefold and use any doubler with the wool cover, and the same with the soaker & double - you can use it with any other cover. That makes it nice. *Follow me @jamaise at Twitter & Tweet this : RT @jamaise #GIVEAWAY #WIN - a Wool-in-Two Diaper Cover set from Tidbit Couture #clothdiapers http://bit.ly/90jZ8Q Ends 10/30 tweet each day for one entry each ! Disclaimer: Tidbit Couture provided me with a product to review. I was under no obligation to review it if I so chose. Nor was I under any obligation to write a positive review or sponsor a product giveaway in return for the free product. These views are my own. I'd love to try the Organic Merino Wool Blankets. I like the 2 size fitted diapers and I am a GFC follower! I like Tidbit on FB! I follow you on Twitter @whatmamawants and tweeted! I don't love fitteds except for night time, but maybe one of the wool wraps? and I would love to try the soap nuts! I would love to try their organic fitteds. Follow you on GFC. Left a description and link on Tidbit's FB page. I follow on GFC and I love their soaps and baby blankets, too! I wrote on Tidbits wall and linked back! I'd love to try the Raw Noil Silk Diaper Liners . Facebook fan of Tidbits #1. Facebook fan of Tidbits #2. Facebook fan of Tidbits #3. I posted about this giveaway on Tidbit's FB wall #1. I posted about this giveaway on Tidbit's FB wall #2. I posted about this giveaway on Tidbit's FB wall #3. I have your button on my blog #2. The Organic Merino Wool Blankets are beautiful! GFC follower. LOve the organic merino wool blankets with the serged edges. I'm following you on GFC and I'm completely intrigued by the silk liners, would love to try them! I follow via GFC and I love their silk liners. I've never really seen anything like it with other diapers, but it is a great choice for a durable liner. i follow via GFC. i would love to try the silk inserts. I follow you publicly on GFC and I saw a LOT I'd like to try on Tidbits. The potty training pants are so adorable and remind me of the old-style underpants kids used to wear many decades ago. The body butter looks good, too, but ultimately, I'd like a diaper and cover to try. mandatory entry: i'm following via GFC and I would be really interested to try the wool soaker shorts since DD is soaking thru all of her trainers and pj's almost every nite! like tidbit on fb #1. "liked" Tidbit on facebook entry #3 Kateri S.
like tidbit on fb #2.
like tidbit on fb #3.